The first souvenir will be a condom. The condom packaging will be transparent with a black condom inside. There will be inspirational phrases written on the front of the packaging in white. For thee condoms, we thought that this was a souvenir that was practical and is a positive way to raise awareness for AIDS and contribute to the show to recognise the memorial is a dedication to AIDS. The second souvenir for the aids memorial will be a vinyl sticker that can be put up all across the city. 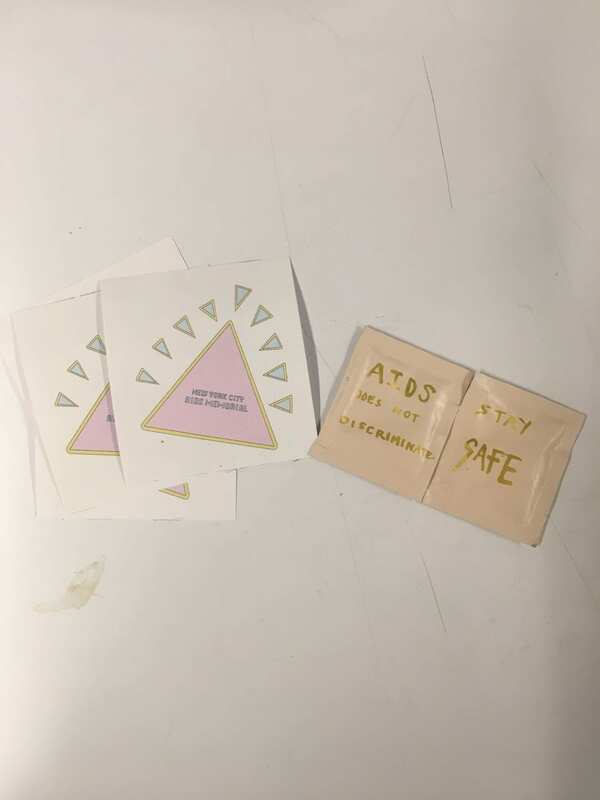 The sticker design consists of a large baby pink equilateral triangle outlined with a yellow stroke. Around the pink triangle, there will be smaller baby blue isosceles triangles with yellow strokes pointing towards the bigger triangle. And inside the baby pink triangle, there is a caption saying “NEW YORK CITY AIDS MEMORIAL”.